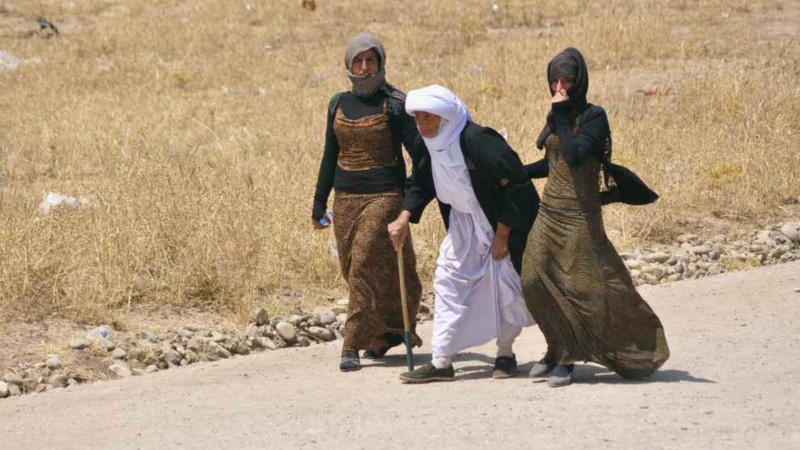 Yazidi women flee ISIS terrorists in Iraq. Lars Adaktusson is a Swedish Christian Democrat MEP (EPP group) and a Member of the Committee on Foreign Affairs. Lord Alton of Liverpool is a UK crossbench peer and the vice-chair of the All-Party Parliamentary Group on Freedom of Religion or Belief. Pieter Omtzigt is a member of the Dutch House of Representatives and a member of the Legal Affairs and Human Rights Committee of the Parliamentary Assembly of the Council of Europe. As allied forces are struggling to retake Mosul, the largest city in Iraq under the rule of the terrorist organisation ISIS, we begin thinking about the time when the region is finally liberated from the reign of horror. ISIS has tried to brutally purge Christians, Yazidis and other religious minorities from the region. Their well-documented atrocities amount to genocide. As more and more villages around Mosul are liberated, new horror-stories are coming to light. ADF International and many other non-governmental organisations are trying to record these testimonies. Future investigations into the crimes committed by militants of the so-called Islamic State will only be successful if the evidence provided is sound and withstands legal scrutiny. The International Criminal Court was established precisely to investigate and prosecute these types of crimes. Its very existence is representative of the promise that the international community would never again stand idly by while innocents were exterminated by virtue of their ethnicity, colour or creed. To date, however, little has been done. The Court has not opened an investigation into the crimes occurring in the region. In April 2015, the prosecutor of the Court stated that the jurisdictional basis was too narrow to open a preliminary examination into the foreign fighters active in the ranks of ISIS. She appeared to infer that a referral from the UN Security Council was in order before any action could be taken. Since that initial statement, there have been two critical developments. Firstly, the UN Security Council will not make a referral anytime soon given the current fractious relationship existing between its permanent members. Secondly, there is new evidence indicating that the ICC has clear jurisdiction over the foreign fighters engaged in the atrocities, with many of them having high-ranking roles within ISIS. In fact, the terrorist organisation is extensively documenting and boasting about the atrocities it is committing, as well as profiling the members involved. There are more than 5,000 Europeans fighting with ISIS in the Middle East. As countries including Germany, France and the UK are signatories to the Rome Statue, which established the ICC, the Court has jurisdiction over foreign fighters coming from these countries. In the past year, numerous institutions have recognised that the ongoing situation in Syria and Iraq amounts to genocide: the Parliamentary Assembly of the Council of Europe, the EU Parliament, the US House of Congress, the UK House of Commons, the Australian House of Representatives, and various United Nations Reports among them. There has never been an instance where genocide has been committed so openly, and yet so little has been done to prosecute the most heinous of crimes. We have a situation where many fingers are being pointed, but very little action is being taken to ensure accountability. So with the jurisdiction for the Court to open a preliminary examination being abundantly clear, the only question is whether the Court will accept it. And make no mistake, while the ISIS fighters are currently miles away from our homes and perhaps not at the forefront of our minds, there will come a day when they will try to return. As the terrorists continue to lose ground, a failure to identify and punish those responsible for committing atrocities may well lead to them coming to European Soil. The recent tragedies in Brussels, Paris and other locations are a testament to this threat. The ICC is a court of last resort, which is intended to complement but not replace the national courts. It must be emphasised that national governments, therefore, have a vital role to play in prosecuting their own citizens who have knowingly and willing joined an organisation which proudly proclaims that it commits genocide. National governments must work in close cooperation with the ICC to ensure that the relevant evidence is preserved, catalogued and deployed in the appropriate proceedings. It is imperative that we do all we can to begin holding some of the most sadistic criminals this world has seen to account. This is why we have urged the prosecutor of the ICC to revisit her initial decision of April 2015 in an open letter, joining the voice of the Parliamentary Assembly of the Council of Europe in a recent Resolution that was adopted unanimously. The Court simply cannot continue to sit on its hands – it must seek justice for the victims of the most barbaric atrocities imaginable. This is, after all, the very reason for its existence. We, therefore, call upon our governments and the International Criminal Court to start investigating and prosecuting these enemies of humanity. My Lords, in thanking my noble friend Lady Deech for initiating today’s important short debate, I refer to my interests in higher education. For nearly 20 years, I held a chair in citizenship at Liverpool John Moores University, where I am an honorary fellow, and was director of the Roscoe Foundation for Citizenship. I have also been a visiting fellow at the University of St Andrews. In September, I was in Jerusalem and Warsaw—two cities which have the toxic story of anti-Semitism written into their DNA. As we have heard, universities have a duty under the Equality Act 2010 to provide a safe and inclusive environment but, as the experience of a Jewish law student at York University illustrates, students have had to use their own resources to seek legal redress and apologies where anti-Semitism has occurred. That should have been done on their behalf by the university authorities. It is the job of an institution’s leaders, and it is a task that they must take very seriously and prioritise without fear or favour. My noble friend is right to remind student leaders of their duties, too, and to insist on monitoring and training. On our campuses, in political parties and institutions, contemporary anti-Semitism can often be the wolf concealed in sheep’s clothing. Jihadist attacks in Toulouse, Brussels, Paris and Copenhagen, the burning of kosher shops in the Jewish quarter of Sarcelles, and the sight of Jews fleeing their neighbourhoods and synagogues under siege by thugs brandishing placards threatening death to Jews have uncanny and terrifying echoes of Germany in 1934. We know how that began and to what it led. I have been particularly disturbed by the growth of online bullying and hate, and by the targeting of opposition Jewish politicians. What is being done to engage the industry and online comment editors in tackling online hate? What response have we had from companies such as Twitter about taking stronger action against hate crimes on their platforms? With around 1,000 anti-Semitic hate crimes every year, it is clear that far more needs to be done, so what assessment have we made of the effectiveness of initiatives such as True Vision and the UK No Hate Speech Movement? Through counter-narratives and the smart power of aid programmes, the BBC World Service, the British Council and the Commonwealth, we must use every possible outlet to combat internet postings and, among other things, Wahhabi-sponsored school textbooks, funded by Saudi Arabia and distributed worldwide. The recent death of Sir Sigmund Sternberg brings me to my final point, which is about interfaith relationships, a point touched on by the noble Lord, Lord Beith. My noble friend Lord Sacks has always led by example. His inspiring books about how we build our home together and learn to appreciate the dignity that comes through difference brilliantly show us what needs to be done. Those ideas need to be understood and implemented, especially at grass-roots level. On this International Religious Freedom Day, when we celebrate Article 18 of the 1948 Universal Declaration of Human Rights, which had its origins in the horrors of Auschwitz and Bergen-Belsen and the other camps, and which promotes the right to believe, not to believe, or to change your belief, we must insist that our Jewish citizens are an essential part of who we are as a nation, and anything which compromises their safety or devalues their place in British society devalues us all. No one should live in fear because of their beliefs or because of who they are. Difference is to be prized and upheld, and the political imperative which flows from this assertion is that wherever it manifests itself we must counter anti-Semitism. ← Foreign and Commonwealth Office Presentation: October 19th 2016 on Why Freedom of Religion and Belief Is Relevant and Urgent and Address give at Nayrouz Service October 20th 2016, St.Margaret’s Church, Westminster, at the conclusion of the Conference.